← Does this picture confirm that TfL plans to dump North South cycle superhighway traffic into Euston Road and Kings Cross gyratory at Judd Street? 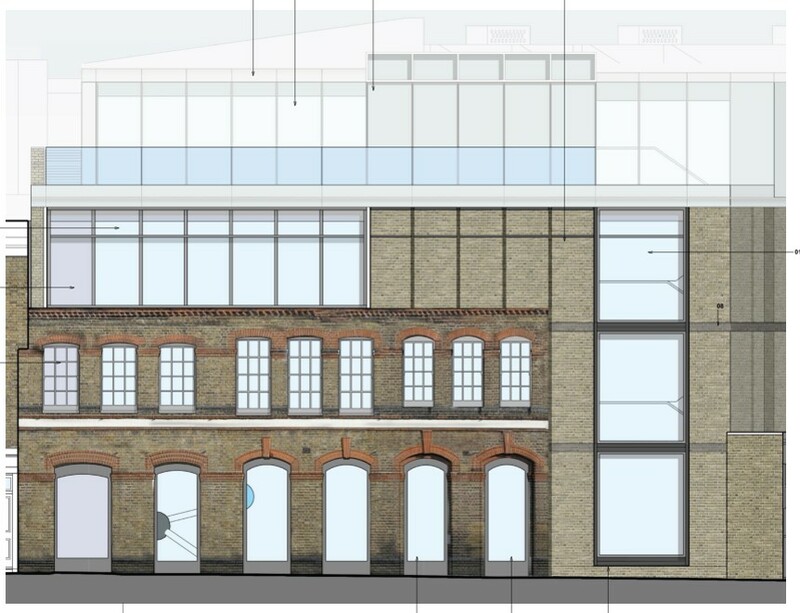 The institute of Physics has submitted plans for a new building in the tired old site at the junction of Balfe Street and Cally Road, near Tesco behind the cocktail bar. I know there is a lot of local interest in this one and IoP have been consulting locally. People are keen to see this much abused site come back to life (it’s been a long time since TG Lynes left). But the site is in a conservation area and backs onto a much loved set of community gardens. A couple of pictures are pasted in here, but the full plans etc (P2014/3577/FUL) are online here where you can comment by 2 October. The drawings are in a big 30mb pdf and the planning statement thing which explains it in english is here. ‘The IOP wants their HQ to be a statement building, promoting both excellence in design and the values of the IOP to achieve sustainable development. In achieving this it has been required to transcend the limitations of adopted policy and guidance, most noticeably in respect of the roof extensions to Caledonian Road and Balfe Street’. 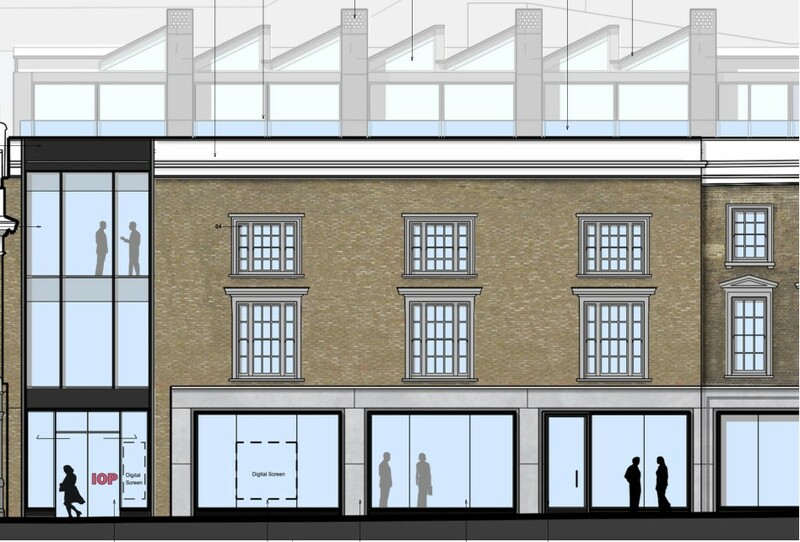 The building proposed is substantially bigger than the volume of the existing buildings and is designed, self avowedly to be ‘eye catching’ which is odd in a conservation area. There seems to be a lot more glass and steel than one sees on York Way for instance. And the factory North light roof in glass is (literally) OTT. So it’s a classic local planning debate – do we want nice new neighbours or to drive a coach and horses through the conservation area, which will then create a precedent for neighbouring properties. I should declare an interest in that I own a small flat about 100 metres North of the site. This entry was posted in Architecture and tagged balfe street, cally road, physics, planning. Bookmark the permalink. Plenty to say on this one given it will be about 3 meters from my house and will have a huge impact on daylight/sunlight/overshadowing/privacy – which they acknowledge in correspondence with me, then brush aside. development will be within BRE guidelines and are therefore acceptable”. This is – quite simply – a lie. On page 6 of the very survey they are citing, they admit that “Construction of the proposed scheme will result reductions in sunlight levels which are in excess of the BRE Guideline 20% maximum reduction”. And this is just the first ‘factual inconsistency’ I’ve been able to find on a quick read as a layman. Others who know more about heritage guidelines and past precedents may have much more to work with. In any event, the IOP have marked themselves out as untrustworthy – I’m not sure why anyone would put credence in any sentence in the document given how easily they ignore – sorry, transcend – the truth. Hi – does anyone know any friendly physicists who might be members of the IOP, who could have a go at them from within? The IOP seems to be going full speed ahead with the construction, not bothering themselves which such niceties as whether or not they’ve received permission. After sending local residents a letter saying they were going to start doing some ‘testing’, they’ve now had a team of a dozen workers in there ripping apart the building for weeks. They say they will start adding the new floors as soon as they’re done. All this while the Planning Committee date hasn’t even been set yet.